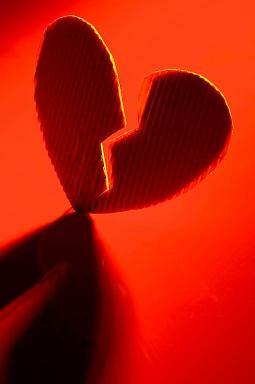 Tania Vaughan: The joy of a broken heart! The joy of a broken heart! Throughout my life I have had my heart broken many times and as I didn't come to Christianity until my late 20's I dealt with those broken hearts by filling my life with the things that the world tells me will make me feel better! drink, shopping, throwing myself into work and anything else that acts as distraction. Since finding God those broken moments seem far away and more recent heartache has been taken to the comfort and loving arms of God to deal with. What has surprised me recently is God breaking my heart! I don't mean in a human way, not because he has let me down, he never does and not because I feel unloved, he always will. The broken heart comes from growth, a growing toward God that means that the things that make His heart break, break mine too! After John the Baptist was killed, Jesus went to a solitary place to spend time with God, as he returned there where many people waiting and it says "He had compassion on them". It would seem that when we, like Jesus, spend time in God's presence it draws us closer to His heart, closer to viewing the world from his perspective and we experience compassion. My heart breaks for the lost that have not found the truth yet of God's amazing grace and love, just as His heart breaks as He seeks to draw them close to Him. My heart breaks for those who have known His love and peace and yet the difficulties in life, the hate and selfishness that so penetrates this world, means that they have pulled away from God and live with fear and doubt. Just as God's heart breaks as He holds tight to them even as they try to let go. My heart breaks for the pain and suffering of wars, famine and corruption all over the news, just as God's heart breaks as He watches His people tear each other apart. And the list goes on and on. Yet, there is joy in the breaking of my heart, joy in knowing that I have grown from where I was. That I am growing everyday to become more like Jesus, drawing closer to Gods heart as I spend more time in His presence I come back to look at the world as He does and my heart is filled with compassion. When your heart breaks, thank God that He is changing your heart to one filled with love and compassion for the lost and the broken. As God holds your heart in His hand, He give you and me the power to hold the hearts of those in need.